Netflix was the idea given to my partner and myself about how we would increase traffic on the website while also creating an opportunity for a new type of social media. Currently, there are ways to watch content on Netflix at the same time with other users, but only using third party web extensions and apps and with various issues of properly syncing and lag/latency. 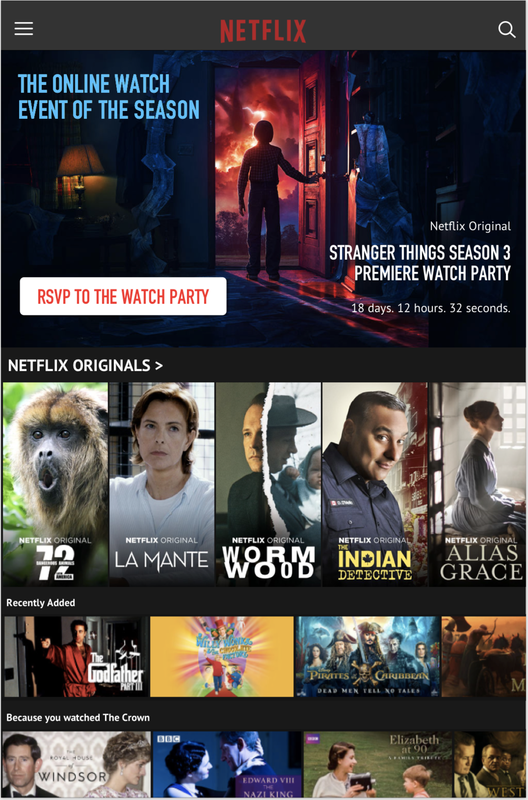 What this new Netflix feature would hope to accomplish is to not only increase the user base but to provide a much more social way to watch content online and have a way to experience it as a unified event. Groups and how those groups are created through its users. 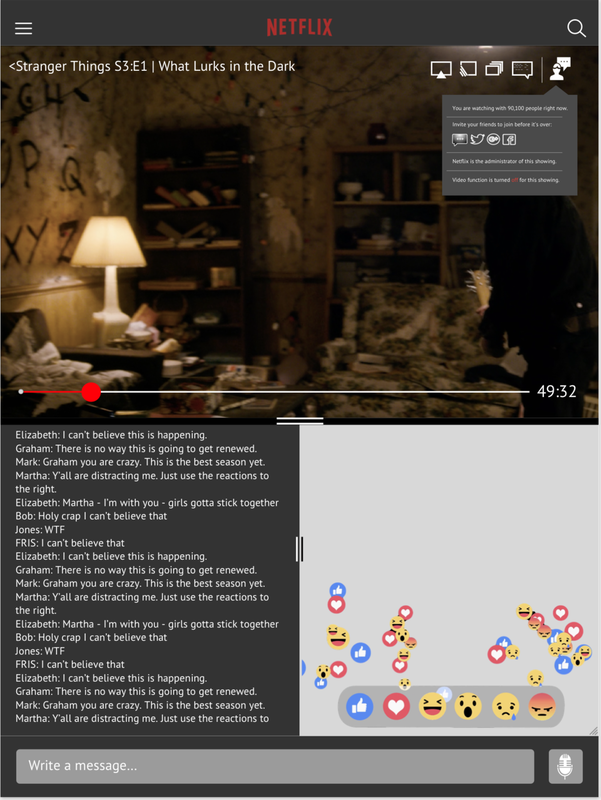 Co-watching movies, commenting and sharing: how often and how desired having more connections would be. New trends in media consumption, like live-tweeting during a live event and video-series binging. Time - with how Netflix is currently structured, how would this effect active conversations, or live events? With how Netflix generally works on a TV or a game console, we decided on a happy medium of choosing a more mobile device, the iPad specifically. The available real estate space on a tablet would likely allow much more room to fit new features instead of a smartphone platform (for the time being). But also for the factor of having something physical to use as text was being added to the new feature, very unlikely a smart TV or a game console would have a readily available device for typing. Netflix has changed our perception on how we consume streaming content and its fanbase is ever increasing because of it. In order to gauge how we broaden its scope to gain even more followers, we need to inspect how they engage with Netflix beyond the App/Desktop view. Incorporating how we perceive additional features into a video streaming platform goes into a few different methodologies of thought. With this project, there were two main ideas in mind on how to approach this. With an "open" format, it would allow for many users to be huddled into a room and converse with each other during a video. And with a "closed" format, we would have a selected set of users in a sealed off room to watch and discuss its content. Once we gathered some data based upon regular users of Netflix through a series of pre-screening and interviews, we started to gather an idea of what we should aim for design wise. With two very different styles of groups to consider, we needed to make sure we had solid personas that would properly represent these types of users and fully understand their needs to progress further. With this in mind, two personas were created to fit our ideas with the open and closed format. With Personas created and established for our core two users, creating the "Happy Path" was our next goal. These paths are intended to show both high and lows of trying to solve common problems and how our design goal would better help the situation. These are made to be specific to the person at hand and are meant to show many types of thinking while a team designs a product, sometimes the story will solve itself whereas there are times where brand new, overlooked issues might occur instead. Which helps the entire team come to a collective solution to progress forward. With the introduction of the "User Flow", these work in tandem with the Happy Paths to show how a ideal path to solving the problem will likely go. This does not take into account for error pages or missed steps but for the most ideal and path of least resistence directed goal for our users. As we hone in more on how we want to cater to the users' needs, we are definitely gaining the idea of how Netflix can use these scenarios to their advantage. With a good picture in mind, we start our work on early wireframes and honing in on the design of how this would be integrated into the existing app. With these early wireframes, we start to decide on what works best within the existing UI of Netflix's near universal design across platforms. We want to be sure that it is not taking up too much precious screen space for content watching while giving a chance to have users interact with each other. After much iteration and discussion, a clickable prototype was made with InVision with very positive feedback from test users. From here we look into some of the challenges we encountered with the case study and thoughts on next steps. One item we had not taken into consideration with regards to the open parties was how the content would be scheduled. 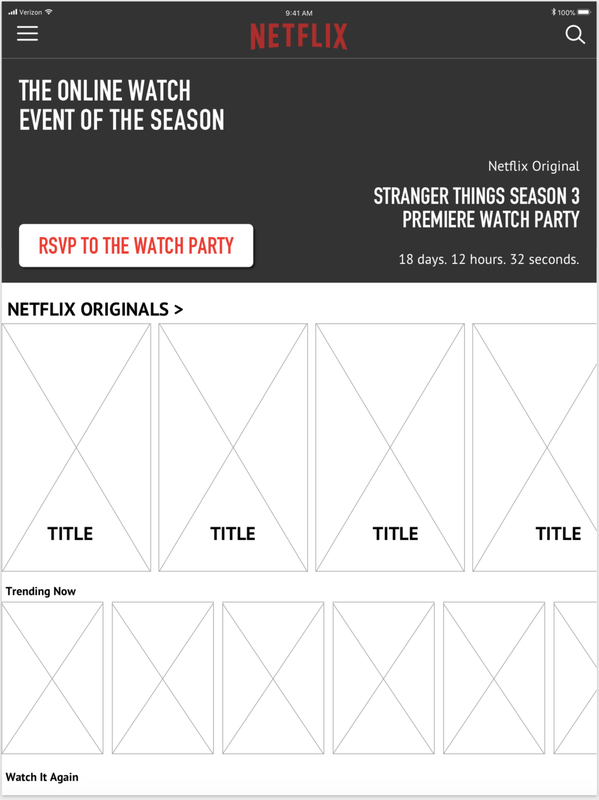 Since Netflix currently uploads a full season at a time when releasing new shows, content would likely need to be staggered in order to avoid spoilers of a show being leaked during a live showing of a new season. Likely a much shorter timeframe of one new episode every few days before the full season is released to the viewing public, having it done on a once a week method like that cable networks do would not be advised since people subscribe to Netflix to get away from that antiquated model. Another item that was discussed was the inclusion of video chat during the closed sessions. Our prime concern with such a large addition to Netflix's was with available bandwidth from the user's end. While Netflix does have a package that includes 4K video for certain shows and movies, the user would need something along the lines of a fiber-optic connection, a very small percent of total users would have that available to use on hand. That amount of resources would likely be used better for other content and future plans. Overall, the design we came up with we feel happy with and will be working on future iterations of the system as Netflix itself changes down the line. While optimized for the iPad, smartphone design is not far behind and wireframes are in progress for the near future. In the end, we feel this will be a vital asset for Netflix to implement and utilize for future premiers and new content.